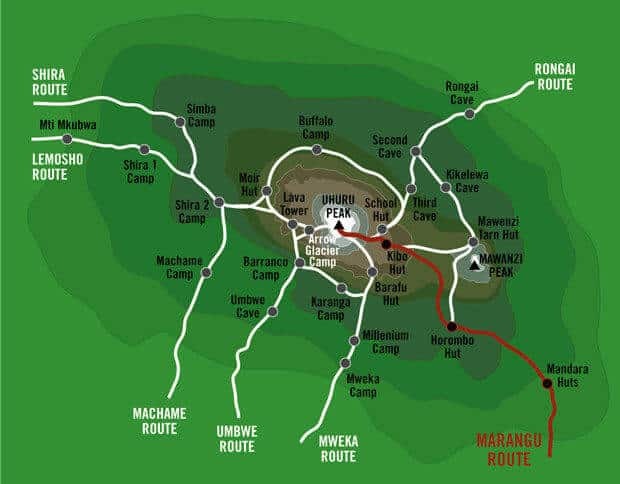 Marangu route climbing guide. Trip duration: Five days, four nights, you spend the night in cabins. From / to Marangu Gate (1980 meters) – Mandara Hut (2700 meters). Duration: 4 to 5 hours, 7 km. You drive from Moshi to the entrance of the Marangu Gate (1980 meters), all things are done here, entrance fees, subscriptions etc. The walk through the rainforest at the foot of Mt. Kilimanjaro, you see all kinds of exotic birds, and black and white colobus monkeys. Arriving at the Mandara huts you can relax and enjoy the surroundings, but if you want you can also walk to the Maundi crater. You have a fantastic view over the Maasai steppe here, the walk takes approximately one and a half hours. From / to Mandara Hut (2700m) – Horombo Hut (3720 meters). KiliDuur: 4 to 5 hours, 11 km. Setting: Tropical rainforest, moorland (lunar). Here you leave the woods, and now walk through a kind of lunar landscape of sand, rocks and stones, with here and there a cactus, lobelia and proteas and some other vegetation. Also, you will see Mawenzi Peak, and Uhuru Peak (the snow-capped summit of Mt. Kilimanjaro). In Horombo you sleep in huts again, if you have an extra acclimatization scheduled here you stay a day longer. From / to Horombo Hut (3720 meters) – Kibo Hut (4703 meters). Duration: 5 to 7 hours, 10 km. The snowy peak of Kilimanjaro is getting closer, halfway this climb is the last water point, but this water is very turbid, so it is advisable to bring enough water purification tablets. From / to Kibo Hut (4703 meters) – Uhuru Peak (5895 m, top) – Horombo Hut (3720 meters). Duration: From Kibo Hut to Uhuru Peak 7 to 8 hours, 4 km – From Uhuru Peak to Horombo Hut 4 to 5 hours, 14 km. Environment: Desert, snow / ice fields. You leave in the middle of the night, so around twelve o’clock, you climb in about six hours to Gilmans Point where you are experiencing the dawn of your life, by this time, all your water is already frozen, and freezes between ten and twenty degrees from Gilmans Point to Uhuru Peak is still a climb from one to two hours, this is by far the hardest part of the climb. The way you can start and run from the top to Horombo hut again, if you’ve arrived here, you sit up there climbing around thirteen to fourteen hours. Time to look at the bed, and enjoy a well-deserved rust.O, LB, AM. From / to Horombo Hut (3720 m) – Marangu Gate (1980 m). Duration: 5 to 6 hours, 18 km. Just before the end, you can, if your feet this still allow at least, visit a waterfall, it’s a detour of about twenty minutes, and I recommend, shoes and with bare feet in the icy mountain water, I can out of their own experience tell you that this feels very good. After that, the bus / car back to Moshi, or drive back to Arusha where you are in your hotel you can take a nice hot shower or take a refreshing dip in the pool. Full board accommodation during ascent, you spend the night in cabins. Getting to Mount Kilimanjaro, and back to Moshi / Arusha. If you Gilmans Point (green certificate) or Uhuru Peak (gold certificate) have passed, then you get to the entrance / exit a certificate with the message that you have reached the highest point in Africa. Climbing Mt. Kilimanjaro is often taken lightly, because we no ropes, irons or other attachments need, this does not mean that you will reach the top. 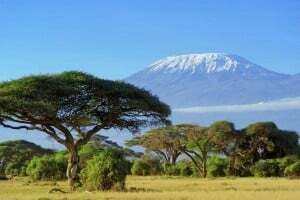 Every year approximately 22 000 people start the climb to the summit of Mount Kilimanjaro, only 60% gets the actual summit also (Uhuru Peak). 40% do not make it have different reasons, it may be because their condition is not good enough, or that they deal with altitude sickness get (throbbing headache, vomiting, nausea, and feeling tired and lethargic), in most cases, this time will be noticed by your guide, but unfortunately there are still too many incompetent guides, or not notice this too late. Every year people die by incompetent guides, be sure you book with a professional and competent company. All our main guides have at least 5 years experience with climbing Mt Kilimanjaro, and have the proper training and papers. Train with a backpack of at least four kilograms, you carry on Mt. Kili itself a backpack that weighs about four kilograms (packed lunch, camera, binoculars, water, etc. ), if you’ve never trained with this you get great muscle soreness in your shoulders.